A half day cycling tour near Phnom Penh capital city. This is a best way to see peaceful Khmer villages, beautiful countryside and silk weaving factory which is located on upstream of the Mekong River about 18km from Phnom Penh capital city. This journey runs from your hotel in Phnom Penh with optional of pick you up to the first ferry near Diamond Islands. All about the Mekong Islands Biking Tour. 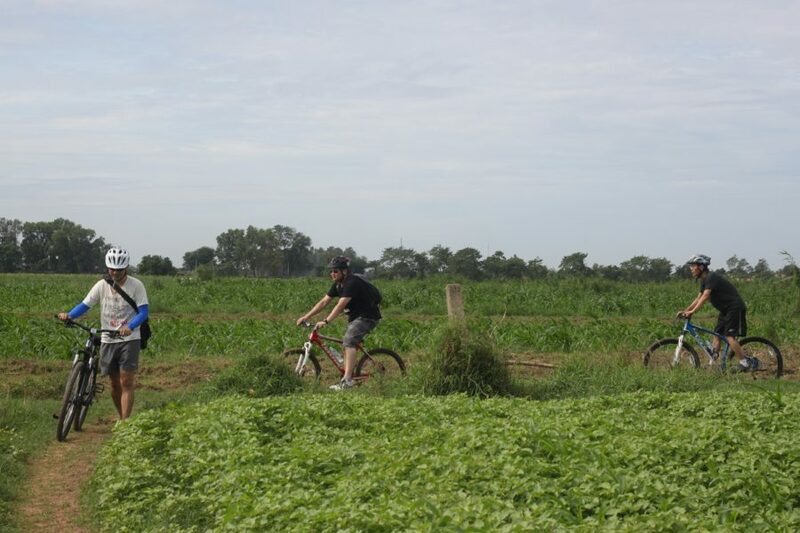 It’s a fantastic way to see beautiful countryside, farmlands and enjoy a morning cycle on back roads through farming villages, and countryside near Phnom Penh city, connecting local artisan of silk weaving where you’ll experience with local people and see a real life of the Cambodia countryside. This journey runs from your hotel in Phnom Penh with optional of pick you up to the first ferry near Diamond Islands. Just 5km cycle ride from the Cambodian capital city of Phnom Penh, there are a mainland and islands where you’ll explore beautiful countryside, peaceful area and pretty local villages by bicycle. Interestingly, you will visit silk weaving house, see silk worm and experience with silk weaving that it is a part of Cambodia traditional silk handicraft and part of local benefit beside of their farming. Islands of the Mekong River is combined by 3 small islands are covering by farmlands, Khmer traditional house and pretty local villages where the local people access there by ferry and easy way to see real life, real culture of Cambodia by bicycle near Phnom Penh city. We will pick you up from your hotel by Tuk Tuk or vehicle upon your group size from 7:15 am, then drive to Areyakhsat ferry Port next to Diamond Island as our starting point. After crossing river by ferry, we will explore the beautiful landscape of greenery rural that rich of fruit and vegetable farms and there are local markets. Our guide will show you the lifestyle of people on the Mekong Island, which based on paddy rice and how they can connect their lives with the people at Phnom Penh City. Continuously, we will visit silk weaving house, silk worm and experience with silk weaving that it is a part of Cambodia traditional silk handicraft and part of local benefit beside of their farming. Then we cycle to second ferry cross to Silk Island. Silk Island is named by tourists located on upstream of Mekong River, farmlands, fresh air, beautiful countryside were make this island get more attractive from local people and tourists. After we cycle through silk islands on quiet back road, we will get one more ferry crossing Mekong River to another mainland as our vehicle supported is waiting there to bring you back to local restaurant and to your hotel for sign off our half day bike tour in Phnom Penh.